Try Thor's #12 tire treatment. It's made to soften go-kart tires and a quart can of it is $17.00. It is 100% Wintergreen oil. A Google search will bring it up. Okay this may sound silly but, I want to try and do this today, and I wanted to get away from ordering the Wintergreen Oil online. I did some research online http://en.wikipedia.org/wiki/Methyl_salicylate, (which isnt the best of sources) and found that Methyl Salicylate is also found in Mouth Wash.. I don't suppose the concentration of Methyl Salicylate is high enough, maybe would be higher in actual Mint flavored Listerine or product of similar tastes, i.e. spearmint, peppermint. But do you think Listerine/Mouth Wash would work?? I believe that a 0.060% concentration would be way too low. According to THIS article, "Wintergreen essential oil contains approximately 98-99% methyl salicylate." Plus, you've got a lot of other ingredients in the mouthwash that may not be good in this application. I picked up 2oz. At 7 bucks an ounce kinda expensive. Do you think 2oz is enough to do a sset of boots? $7 per oz is pretty steep, you should be able to find it cheaper. I used 8oz per gallon of water to do 4 boots at a time. 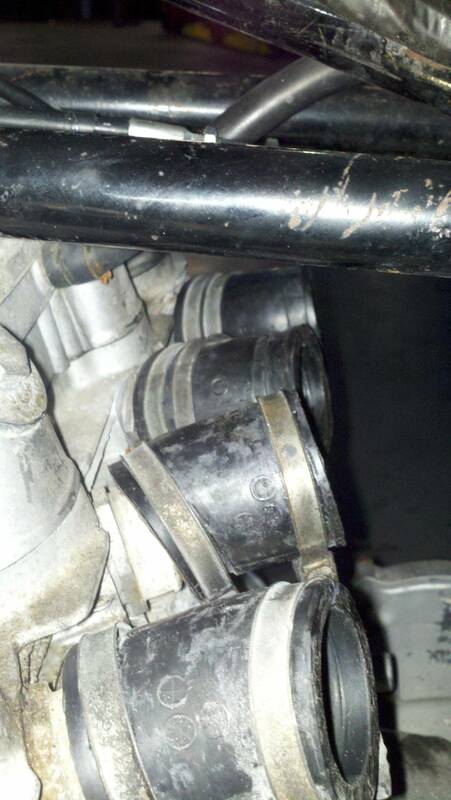 My '84 VT700 has CV carbs, and I had both diaphragms tear. I ordered some old carbs on ebay and one diaphragm was ripped and the other was stiff from sitting 10 years. So I ordered 2 new diaphragm slides from Service Honda for like $90 each. I stuck the old intact one in a jar with a 50/50 mix of MMO and STP. That was more than 2 years ago. Every once in awhile I check on it, and now it feels very supple, not unlike the ones I got from SH. I'm hanging on to it partly as an experiment, and partly as an emergency backup. Who knows if it really helped at a molecular level, but subjectively, it seems to have revived the rubber. did you bleed when you built that? Do you think this would work on my seat cover? I bought a near perfect CB650 seat off of eBay but the vinyl is a little hard feeling. I haven't done anything with it yet but I've been pondering how to soften it up a bit. Maybe massaging the wintergreen into the seat? 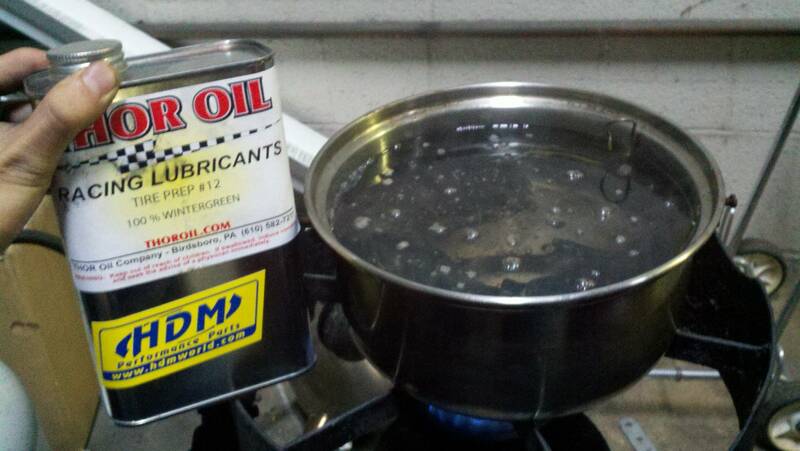 Has anyone tried soaking manifold boots or other old rubber in good ole 'mineral oil' ? I'm thinking of pulling my carbs off to clean and rebuild them but the boots of course are rock hard. If I get the xylene/wintergreen mixture how would I apply it to get it off? I bought some wintergreen oil. But, I've been looking for Xylene for a couple weeks now. Can't get it anymore in California. They are also changing or eliminating paint thinner, MEK, Naptha, and some other common solvents to a single all-in-one "environmentally friendly" chemical substitute (at a 50% price increase over previous availability, to which they apply a 9.75% sales tax.) To me it seems the impetus is to be more effective at fleecing the populous. Don't raise taxes, just force whatever is purchased to cost more, gaining revenue "hidden" from the general populace. If past experience is any judge, the "new" solvent simply won't do the same job as the old ones. I had good result using the wintergreen oil and water and heating up outside on the grill and letting the rubbers simmer in the wintergreen oil/water for about 2 hrs or so. Did it outside so the house wouldnt stink for weeks. There a few others on here who used the same steps and had good results also. I was referring how to get them off the bike. I'm not sure how I'd "grill" them attached to the cylinder head. not a problem longshanks, Id try some lube (penetrating oil works well) and a hose pick (search google for radiator hose pick to see what im talking about) and take your time working the pick around each carb. 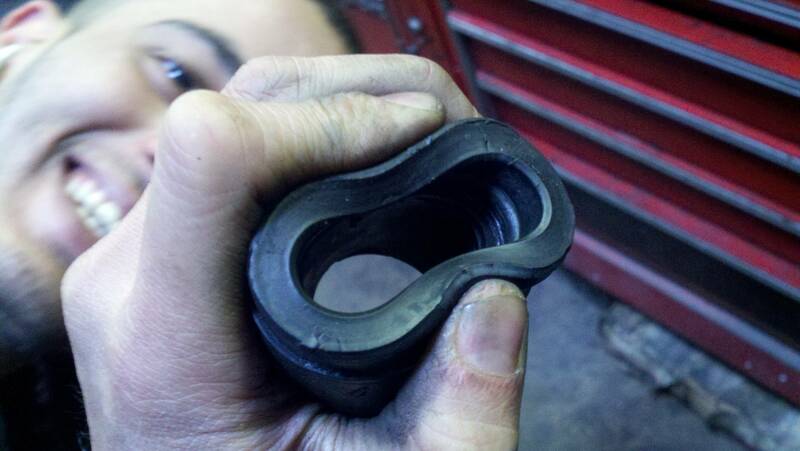 The pick helps break the seal between the rubber and the carb. I just had to take my carbs off and bench sync them before I start this thing. Before when I had tthem off I really did not have the advantage of all this knowledg from this site. But now there is no way to get these boots on without a ton of curse words and a final "screw it I will wait till i can offord new ones"
I saw someone ask if 2oz was enough and mystic stated that he had used 8. But this stuff is 7$ for 2oz. Can I get away with it? Has anyone come up with a basic recipe for this at all? I plan on using wintergreen and water. But again I ask is 2oz enough? Plain old Xylene from the hardware store works fine and is way cheaper. "If you can't fix it with a hammer, then it's an electrical problem"
I decided to use a 8 oz of wintergreen oil to 1 gallon (128 oz) of water to submerge and heat the rubber components over [1 oz:16 oz ratio]. I tried to keep the water from boiling and just get the water rolling. I didn't want to use the Xylene because it sounds like treatment takes a long time, also I didn't want to worry about the hazardous effects. I did my 2 drain hoses, fuel lines, and 4 carb boots. Here are the boots beforehand, pretty dry and not pliable. I couldn't compress them at all. I was soaking some fuel hose just to see how much deposited varnish was inside from sitting with an old tank of gas. The solvent was lacquer thinner. I like to use lacquer thinner to soak carb parts that do not contain rubber as it is completely gentle on the metal and the varnish gets very soft or just dissolves away. Anyway, after the lacquer thinner had it go at the fuel hose for a few days,the hose was very soft and had swelled quite a bit. After it had a chance to dry out,it did remain soft. Of course,I never used it for fuel hose again,so please do not tell me how I will experience a flaming death. I may,however experience a flaming afterlife,if I don't change my ways. Lacquer thinner is not as hot a solvent as xylene,but it may be worth a shot if xylene is not available in your area. Gonna get me some of that Thor tire softener -- it looks like a good deal. So I learned a few things from the softening process. I found that if you put the old hard boot into a female pipe fitting of the proper size, that the boot will get soft and still retain the original dimension. I had to soak my boots for 60 hours until they got soft,and then I put them in a bath of wintegreen for 8 hours so the wintegreen would go into the rubber as the solvent evaporated. I was too stupid to realize that if the boot was left free to soften,and it did swell in diameter about a quarter inch oversize. By putting [actually threading] it inside a PVC 1.5" threaded fitting and placing it in 180 degree water for an hour, and then placing it in cold water,it returned to normal size. Does marvel mystery oil have wintergreen in it? 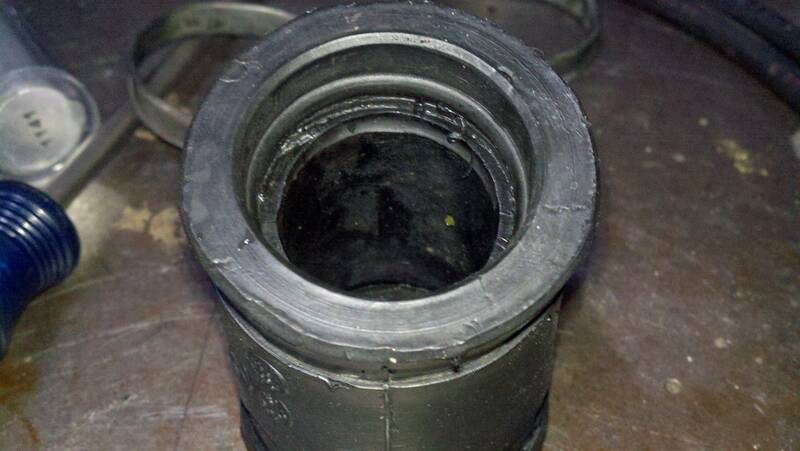 this is simply FYI but I had some old rubber grommets from my 1971 cb750 and I wanted to see what canola oil would do. I put them in there and submerged them completely then got busy andy forgot about them (for about a month, lol) and when I took them out and wiped them off they were plyable and seemed almost new. Try it out! I’d have replied sooner, but I wasn’t a member back then. This works well when I was pulling old wiring out of the handle bars. The plastic sleeve hardens and is very hard to pull through. Pore this solution into the bars and let it work overnight. Everything softened and slides out easily. Makes installing easy also. It demonstrates the efficacy of a number of the options contained in this thread, and the author goes to some considerable lengths to show results in both the short and longer term. Since watching, I've tested the 3:1 Wintergreen / (isopropyl) alcohol mix and can confirm it's astonishingly effective. I'm working on a '66 CL77 which had hardened rubber bits all over it. After a day or two in the mix, the rubber is nearly as flexible as it would have been when it was new, and the effect lasts long enough to suggest it's pretty much permanent. The only slight downside is, as the video author points out, that sort of mix isn't cheap - although that's a relative perspective especially if the parts you need to revive are obsolete or just very expensive. My advice would be to make up a batch in a resealable container so it can be reused; mine's been in use for a month or so now and shows no sign of slowing down. I'm using a couple of oversized jam jars but may upgrade to a large mason jar from Ikea.